This sermon was preached at Asbury United Methodist Church in Livermore, CA on Sunday, February 8, 2009. The lectionary texts I used in the sermon were Isaiah 40.21-31 and Mark 1.29-39. I’m going to briefly show you a couple of these drawings, and then I’ll end with one in particular. In this last drawing, you can see that this person drew God as a man, with a beard, sitting in a cloud in Heaven. Below the cloud, way down beneath you can see earth and you can see some tiny stick figures. While this is the only drawing I have that incorporated this specific image of God, this was by far the image that most in our class had when they were children. And I’m guessing that it’s an image many of you may have had when you were children as well. It certainly was for me. When I was a child, I always imagined God as the all-powerful, almighty “old man” up in Heaven – and yes, the image of God was certainly that of a man. He had a large white beard, flowing white robe and was sitting high in the sky keeping an eye on everything. In some ways, this idea of God was kind of like a Cosmic Santa – he sees you when you’re sleeping, he knows when you’re awake, he knows if you’ve been bad or good, so be good for goodness sake! As I was reading the passages from this week’s lectionary, the Isaiah passage reminded me of that early childhood image of God that I had. Isaiah writes: “Have you not known? Have you not heard? Has it not been told you from the beginning? Have you not understood from the foundations of the earth? It is he who sits above the circle of the earth, and its inhabitants are like grasshoppers.” I think back to the last drawing we looked at: picturing God sitting up in the clouds of heaven, above the circle of the earth, looking down on all the grasshopper-like people. Over and over throughout the book of Job, and in the passage today from Isaiah, we are told that God is the almighty, all-powerful, all-knowing, ever-present God. God created the heavens and the earth and spun the world into being. And so it’s no wonder we grow up with these images of God as this distant but powerful God – this God who looms over us. Yah. It was THAT God who decided to come and be with us. And that is the mystery of the incarnation – that the Creator God of the Universe came down to live among us. The Message, a contemporary translation by Eugene Peterson, says, “The Word became flesh and blood, and moved into the neighborhood.” And that God came in the form of Jesus. We get to see a glimpse of that Jesus in our second reading today – we see Jesus working his way through Galilee, and we hear about his wonderful signs and deeds. Marks’ gospel is a fast-paced Gospel; it uses the word immediately over 30 times. Story after story, miracle after miracle – we get to see the powerful ways in which Jesus changed the course of history through his actions. So, in some ways, the passage today is kind of…well, it’s a little boring as far as Mark’s gospel is concerned. Jesus gets rid of Simon’s mother-in-law’s fever, cured some diseases, cast out some demons, and then left to a deserted place to go pray. That’s basically it. We don’t get any of the big blockbuster stories of Mark – like the healing of the paralytic, Jesus stilling the stormy sea, or perhaps the most confusing one when Jesus sends the demonic spirits into the pigs, who then run off a cliff and drown. But if you think about it, we don’t really need the big stories – the big miracles. If we just take a step back, and realize the fact that the almighty God, the God way up high in the sky…THAT God decided to give all of that up to come down to earth and be with God’s creation. Isn’t that perhaps the greatest miracle? That God is not only the all-powerful God, and the almighty God – but that God is also the ever-present God, the God who is with us, side-by-side, walking with us through our daily journeys. I don’t know if any of you have ever been to the Sistine Chapel before – I’ve only seen pictures of it myself, but these passages today reminded me of the “Creation of Adam” fresco that was painted on the ceiling of the Chapel by Michelangelo – probably one of the most famous images in the world. This is perhaps another reason why many have this image of God as a great old man in the sky with a white beard. If you just look at God in this fresco, it’s clear how you could get this image. 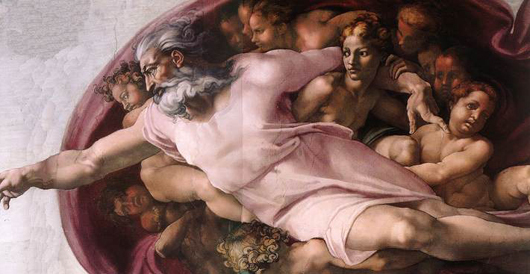 He’s up in the sky, surrounded by his cherubim and actually, you can see that he has his arm around Eve, who apparently is waiting up in heaven until God gives her earthly form. A very muscular, powerful looking God. 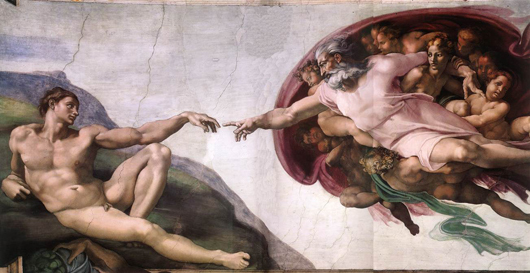 I think it’s important to think about what this image of the hands can mean for us today…yes, God is all-powerful. And I think that for many people, that is a comforting idea and image of God. Certainly, in our current economy, with people losing jobs and money and not knowing what the future holds, there can be a certain comfort and security that we feel when we reflect on the fact that God is in control. That God will work everything out according to God’s purpose. But perhaps even more comforting than the idea of a God who is way up high keeping an eye on things, is this image of God who is reaching out to us, of a God who is in the midst of the messiness of our lives. Emmanuel. God who is with us, in every way. We see that most uniquely by the incarnation of God in the flesh … in the person of Jesus Christ. We experience it on a daily basis as we know and trust that God promised God’s Spirit to be with us forever, guiding us, helping us, praying for us and allowing us to see God in all areas of our lives. The Gospel of Matthew ends with Jesus saying, “And remember, I am with you always, to the end of the age.” As we leave this place today and go throughout the routines of our weeks, I wonder if we would look at things differently if we remembered that more often. That God, the almighty creator God, is with us. Emmanuel is reaching out to us. I should note that one of my sentences above is not all that accurate theologically. I wrote, “A birth of a baby boy who would grow up to become the Savior Jesus.” So, clearly Jesus didn’t “grow up into being” the Savior; rather, he was always the Savior and always will be. Anyway, just wanted to clarify that line for you. Adam, would love to see some of the actual drawings that went with this if you could. Hope to see them. I think that was a powerful exercise. I too am curious about the pictures… especially about the Middle/HS and “current” ones. lets not forget that this is not part of the cannonised bible, taking interpritation and applying it wo the bible is what causes war…. No, it’s okay to say jesus grew up to be our savior. As we follow the truth, our truth grows, until others cannot handle the truth, then you may become persecuted for your beliefs… It’s another dimension of looking at jesus christ. A pattern of energy that can be written in relativity that is infinite. All leading to one source, and looking to infinite possibilities.